Can I have the jets placed wherever I want? Hydro Massage tries to accommodate all requests, if the request is within engineering standards of the model. What do the Accumassage jets do? Target highly sensitive points in the back, shoulders, and neck with a pulsating stream of water and air. What does the Ultra Flow jet do? Produces a powerful stream of water and air that targets hip and leg areas. What does the Micro Flow jet do? Produces a medium stream of water and air that targets the back and arches of your feet. How do I turn off the Ultra Flow and Micro Flow jets? They can be turned off at the jet by turning the outer ring of the jet. What is the optional Ultra Massage jet? This jet delivers a powerful pulsating massage that targets back, hips, legs, or feet. It is an optional jet that replaces the Ultra Flow jet. What is the optional Micro Massage jet? This jet delivers a medium pressure pulsating massage to the back and feet. It is an optional jet that can replace the Micro Flow jet. Can I flip the back systems on a side drain tub? Are the metallic jet trim kits available on all jets? Yes, they are available on all whirlpool jets with the exception of the sole soothers. GPM (gallons per minute) are a measurement of the amount of water that is moved by the pump through the jet. PSI (Pounds per Square inch) refers to the pressure produced by the jets. What is the difference between the different air systems offered and what comes standard? Air Silver has Classic Air System with air caps on the side wall. Air Gold as EZ Clean flush air jets on the side wall. Air Platinum has EZ Clean air jets on sidewall as well as the floor and back. What are the advantages of classic air (air injector buttons) offered on the combination jet packages? These jets deliver air out of 6 ports around the perimeter of the jet. What are the advantages of the EZ Clean air jets? EZ Clean air jets are easier to clean and produces a powerful stream of air. What are the advantages of the floor air jets? The in floor HTT air jets provide air massage directly to your legs and hips. How much pressure does the air create? It provides soft tissue massage, with the air bubble growing larger as it moves toward the surface. Which air system is the best? Air Platinum provides a full body massage for the back, legs and around the entire body. Gold and Silver Air Systems target different areas of the body. Why do the HTT and EZ Clean air jets in the floor /perimeter cost more? The floor and perimeter air holes are more costly due to the installation process and cost of materials. What are the differences between the jet packages offered? The difference is based on the type of hydrotherapy and the features of each package. Which jet package has the most jet pressure? What is the best selling jet package? Hydro Gold and Combo Gold. Can I request special placement to put jets where I want? Yes, but every model is different and you must check with the factory first. How do Hydro Massage tubs compare to the ones at home centers? 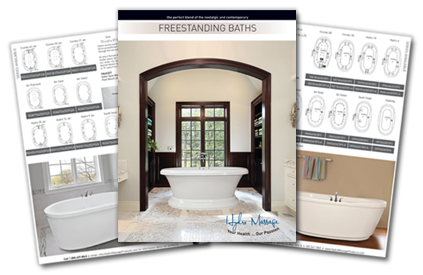 Our baths provide the best hydrotherapy on the market, contain more features, and offer more styles to choose from. We build our baths with superior materials and use better construction techniques which ensure a high quality bathtub. What are electrical specifications for jet packages? It varies by Hydrotherapy series. Please refer to the specification book by model. Can the pump and inline maintenance heater be on the same circuit? No, each needs to be on a separate electrical outlet. How do you turn on the pump? Push the on/off button on the inside lip of the bath. How does the 3-speed control work? Control turns to each of the three speeds: H-High, M-Medium, L-Low. What are the electrical requirements of the pump? You need a 115 volt 6FCI dedicated circuit. hp referes to Motor Hydro Power rating. Is the pump hard wired? No, it is a plug-in with ground. What is the decibel level of the pump? A pump and blower will make some noise depending on the installation technique and room environment. Noise can be reduced with insulation around the walls not next to the tub. How far does the pump stick out? The pumps and plumbing are normally within the perimeter of tub, but it could be up to 4” beyond the lip on select models. The cord is 24” long. Are there special locations to install? The air blower can be installed remote up to 15 feet from the bath unit. The pump can only be installed at the factory in the standard or optional areas shown in the price spec book. What type of access is required and where do I put the access? Code requires an access door available to access the pump(s). The access door must be large enough to enable the equipment to be removed from the bath. It is recommended to be a minimum of 18”x18”. How do you turn heater on and off? The inline heater automatically activates when the pump is turned on. What temperature does the heater maintain? It maintains the temperature of the water that is placed in the bath. It will maintain heat to 104 degrees + or – 2 degrees. Is the inline heater hard-wired? No, it is a plug-in with ground plug. It requires a 115-volt, 20 amp GFCI dedicated circuit. In the plumbing system near the pump. The Whisper Flo Heat System consists of a pump, insulation, and heating system which helps maintain water temperature, offsetting the cooling of the air blower. How does it keep the water warm with the air system or soothing soak? With the pump, insulation and heating system. Is it worth it – what are the advantages? Yes, the system helps maintain a consistent bathing temperature. Where are the intake/out-take fittings located? The intake and out-take fittings are on the side of the bath. Can I put the intake/out-take fittings wherever I want? The fittings have to be centered on the bath. The Hydro Clean sanitation system kills bacteria in the water. What are the advantages or disadvantages of having the system? It is 200 times more powerful than bleach. It only works when the system is operational. The system is all natural. It does not remove organic materials like makeup. The sanitation system works automatically when the pump is turned on and off. It has an indicator light on the unit by the pump. How does it work with the jet system? The sanitation system unit is tied into the plumbing system. What does the tile flange do? It prevents water from penetrating into the wall or sheet rock around the tub. Do I need a tile flange on the tub I am ordering? Not unless it is being installed into an alcove three-wall installation with tile installed down onto top lip of the bath. The EZ Clean Dual Stage Flange is either molded into the bath or it is single stage chemically bonded by request. If I don’t need it after I get the tub, can I take it off? No, it cannot be removed. Why is it installed on the tub? To provide support and ease of installation. How high can I make the leveling feet go up or down? The leveling feet go from ¼” to 2”. Can I order my tub without level base even if it is standard on the tub? Yes, however, the height of the bath will change from specs. What colors are available for grab bars? White, Biscuit, Bone, Polished Brass, Chrome, or Satin Nickel. Can I have the grab bars specially placed? Yes, but it must get factory approval first. How many bars do I get with my jet package? One grab bar on most side-drain models, two grab bars on end-drain models. How does the neck pillow work? Turn the neck massage valve on the side of the bath and this will increase or decrease the pressure out of the two neck jets. Do I have to use the Lycra cover? Yes, or water will splash into the bath area. Does it turn off completely to keep hair from getting wet? Valve will reduce the flow up to 95%. What are standard colors available for neck pillow? The neck pillow comes in White or Biscuit. What are the standard colors available for Hydro Massage tubs? Standard colors are White, Biscuit, Bone, and Almond. Lead times on standard colors is 10-12 days if color is in stock. Can you send me an acrylic chip sample? Is there a difference between the shades Bone and Almond? How much lead time is required for design colors? There is a 3-10 week lead time for designer colors. Is a particular designer color available? Only those shown in the catalog. Does the jet color match the designer color or do I have to order the optional metallic jet trim? Yes the jet matches the bath color. What are the benefits of having chromatherapy in my tub? Light can create specific emotional responses and enhance the bathing experience. It is called chromatherapy. How do the lights turn on? Push the air switch button and it turns on. Continue to push the button and it sequences through the lights. The bulb can be replaced from the front. Remove the lens with the lens tool, remove the bulb, then replace bulb. How does aromatherapy work in our tubs? A bag of aromatherapy beads are placed into the aromatherapy canister and the fragrance is carried into the jets through the plumbing lines. Where is the canister located on the bath? The canister is on the deck of the bath. Remove cap to place aromatherapy beads into the canister. Can I put oils in the canister? How do I change the fragrances? Put new bags of Scents into container. What is the overflow height? What is the measurement from under the lip to the floor? Refer to specs downloadable on website. What is the bathing well length and width? Shown on the spec sheet. It is on the first spec drawing under Platinum model. Will the tub fit through my bathroom door? Yes, in most cases, it will need to be turned on its side and it will fit through a standard door opening of 30″-36”. What is the decking area measurement for the faucets? Refer to specification that shows the amount of available deck area. This will vary by design. Purchaser should also understand that plumbing may not fit on corners due to existing pump and plumbing configurations. What is the measurement for the cut-out to drop in the tub? Normally the measurement is 1-1.5″ less than the length and width of the bath. We recommend all dimensions be taken off the tub when it arrives at job site. Template is available on all oval tubs.